Use new boxwood comb after soaking the teeth of the comb with botanical oils such as camellia oil or olive oil with gauze or tissue paper. Make sure to wipe off the extra oil and not apply oil to the painting for it may cause discoloration. The boxwood comb will retain a polished light-brown finish if maintained well once every several months with camellia oil. 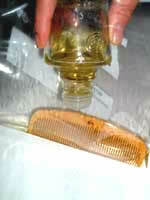 If the comb is in bad condition, put it in a plastic bag and soak it in camellia oil overnight. Wipe the comb with gauze or tissue once taken out of the bag. 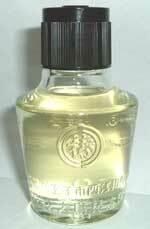 Also, apply camellia oil on a toothbrush to clean the teeth of the comb. 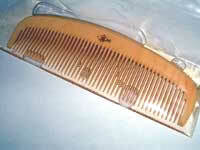 Washing the comb with cold or hot water will cause it to lose its luster and may distort or break. Please also never wash with detergent. 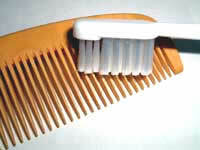 It is also very important to use the comb only for dry hair and never with wet hair. 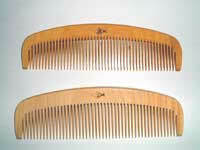 Japanese boxwood combs are capable of enhancing your appearance with its beauty and functionality. Japanese traditional boxwood combs do not create static helping make all hair look beautiful. accessories to compliment the kimono, haori coat, kanzashi,and yukata. The boxwood comb is a great gift and can be shipped to any place in the world.